I did two things of note yesterday. The first being that after a grand total of 354.5 hours throughout a year and a half, I finally got my Blood Elf Warlock, Erilynn, to level 70 in the World of Warcraft. Had the new expansion of the game not come out 2 months ago, pushing the highest possible level to 80, this would be huge. However, since I'm pretty pathetic at the game, I still consider this a big accomplishment. No, I did not make that certificate for myself, and yes that has already been suggested to me. 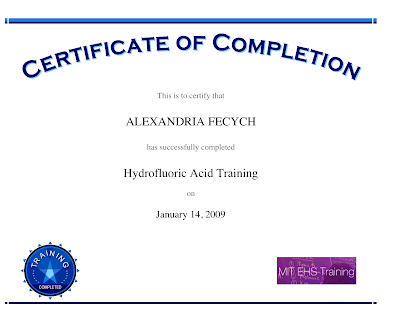 I have two others for Chemical Hygiene Training and Hazardous Waste Training. I know what you're thinking, and yes, I did print them out and pin them to the wall above my desk. Good. Now when I pour the stuff on my face youll know what to do!! I used to do that in high school. It freaked all my teachers out.